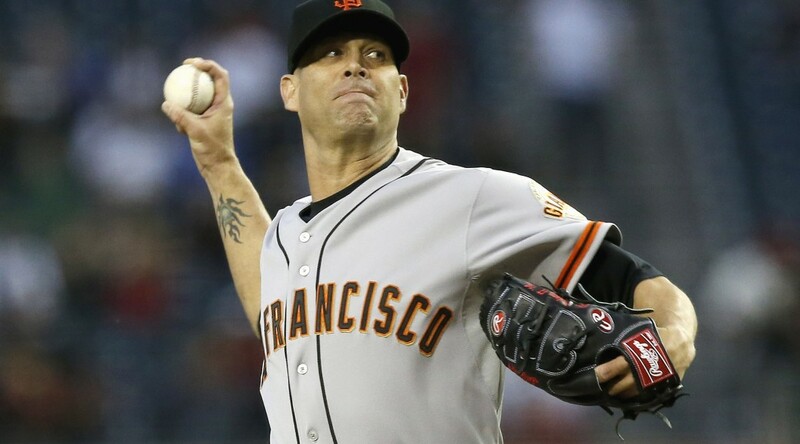 Scottsdale, Arizona –Tim Hudson went 1 1/3 innings, faced eight batters, and allowed five batters to reach base. With all that said he didn’t give up a run to the Diamondbacks . San Francisco Giants shutout the Arizona Diamondbacks 5-0 on Sunday. The World Champions Giants, finally got a win. They only had one win in it’s last 10 games. Diamondbacks Archie Bradley also struggled. He allowed two runs and six hits through three innings of work. He struck out two and didn’t issue a walk. Ehire Adrianza had two hits and an RBI for the Giants. Matt Duffy hit an RBI triple. Brandon Crawford added a hit and scored a run. He played at shortstop. Juan Perez added two hits, including a double. Ex-Giant Cody Ross had two hits for the Diamondbacks. San Franciscos’ Center fielder Gary Brown threw a runner out at the plate in the first inning keeping the game scoreless. Hudson: “I need to work on release-point stuff, mechanical stuff,” he said. “The plate is moving around on me, but that will get better. From a workload standpoint I’m ahead of where I thought I might be. I didn’t think I would be out this early, but I am. You can’t look at numbers and say too much. The World Series MVP (Bumgarner) has given up a run this spring, ” Hudson added. Giants: San Francisco is moving OF Norichika Aoki to left field and will use Gregor Blanco or Juan Perez in right until Hunter Pence returns from injury. Diamondbacks: Arizona released OF Ben Francisco and reassigned RHP Blake Beaven, RHP Aaron Blair, RHP Justin Marks, C Matt Pognozzi, RHP Braden Shipley and C Mark Thomas to minor league camp. LHPs Vidal Nuno and Andrew Chafin are no longer being considered for the starting rotation but remain in the bullpen mix. Hunter Pence (broken right forearm) had his cast replaced. He will wear one for a month. Diamondbacks: RHP Addison Reed (shoulder soreness) continues to throw bullpen sessions as he works himself into condition to open the season on time. Diamondbacks: RHP Randall Delgado starts Monday against the Chicago White Sox. Giants: RHP Chris Stratton starts Monday against the Cincinnati Reds. San Francisco reliever Sergio Romo is also expected to make his spring debut.